Gabriel Thompson is a Steinbeck Fellow in Creative Writing at San Jose State University. He is the author of several books, including Working in the Shadows, and has written for Harper’s, New York, Mother Jones, Virginia Quarterly Review, and The Nation. "Those who know the name Fred Ross probably identify him as 'the man who taught Cesar Chavez how to organize,' as he was once dubbed by The Chronicle. Most Californians probably have never heard of him. 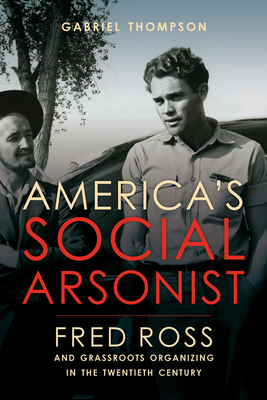 Gabriel Thompson’s superb new biography of Ross, 'America’s Social Arsonist: Fred Ross and Grassroots Organizing in the Twentieth Century,' will be fascinating for both groups. The author sheds new light on the life of a man whose presence was behind the scenes but whose work ended up in the headlines. . . . Thompson has plumbed Ross’ extensive notes and files to relay vivid accounts of his experiences and insight into his ideas. During his half century as an organizer, Ross pioneered tactics that are widely used today. 'But,' asserts Thompson, 'his greatest legacy is in the people he inspired and mentored who went on to shape California and U.S. history.'" "In America’s Social Arsonist, Gabriel Thompson captures Ross’ life story and core ideas. It is among the books to be read by anyone interested in labor or community organizing and the future of democracy as more than marketing politicians to consumer “citizens” when real power lies in the hands of those with money. . . . This brief review can’t do justice to Ross, or to Thompson’s telling of his story. It’s an important story, well told. Read the book!" "One of the most profound meetings in San Jose history occurred on the evening of June 9, 1952, when a wiry community organizer named Fred Ross knocked on the door of 25-year-old Cesar Chavez and asked him to become a leader of his people. . . . Until recently, Ross has been seen as the less prominent partner in that meeting. He generally avoided the limelight before his death in 1992. But now a new book, 'America's Social Arsonist,' by Oakland-based writer Gabriel Thompson, recounts Ross' career and his huge impact." "This is an absolutely must-read book for organizers, those interested in organizing, and those interested in how to achieve progressive social change. It is also perfect for book groups, inspiring discussions sure to go far into the night." "Gabriel Thompson has produced a masterful and engaging book about a premier American organizer, Fred Ross Sr. . . . This fine book is many things – useful, moving, and sad. It highlights the creative innovations and the painful lessons of an organizer who spent his career behind the scenes, but who is getting, at long last, the attention he richly deserves." "An excellent biography . . . (4 out of 5 stars)"
"America’s Social Arsonist is a compact synthetic history of the social justice movements in which [Fred] Ross played an important part. And Ross certainly deserves the credit Thompson gives him for pulling together key elements—especially putting house meetings at the center—during the early post-World War II fights to create an effective modern organizing playbook." "...Ross is mostly forgotten today. This is why Gabriel Thompson's new book, which finally provides a rich and detailed history of Ross, is so important. [...] This book is a must read for anyone interested in the history of organizing in America." "Gabriel Thompson’s useful, readable biography of this single-minded man reminds us of both the heroism and personal cost of the organizer."